A few things happened this week that alerted my “Fashion Police” alarms. They all encompassed women with short or full faces wearing unflattering accessories or shirts. 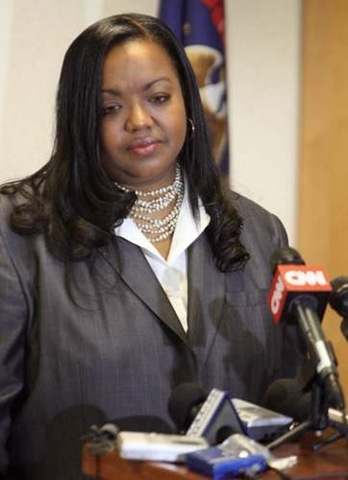 This is a picture of Wayne County Prosecutor Kym Worthy. As you can see in the picture, she has a full face and the appearance of a very short neck with this necklace. Another local reporter was wearing a round neckline this week that made her look like she was just a head resting on her shoulders. Therefore, I decided this week’s fashion lesson should center on how to dress is you have a long or short neck. Do choose tops and blouses that have a V or U neck to draw the eye down to lengthen your neck. Do wear blouses with pointed collars unbuttoned. Do choose jewelry that is longer or has a V shape drop. Do choose longer dangling earrings or hoops. 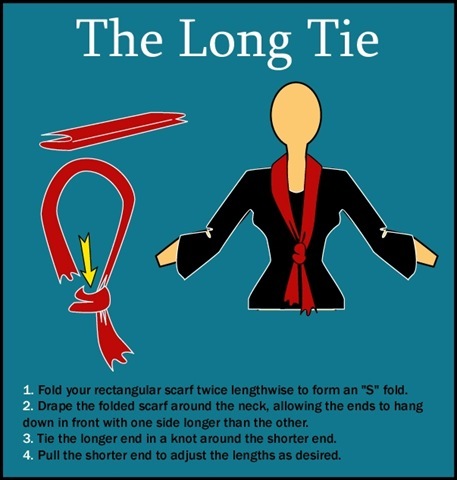 When wearing a scarf, do tie it lower to elongate your neck. Don’t wear choker style necklaces. As you might imagine, a long neck is the anthesis of the short neck so the opposite would apply. 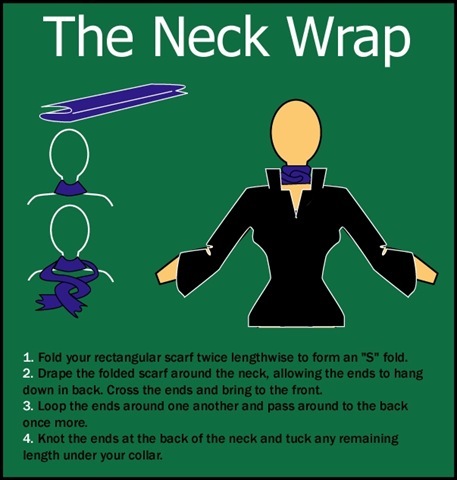 Do enjoy wearing a turtleneck or a collar folded up. Do wear jewel neck shirts. Do wear large choker style necklaces. 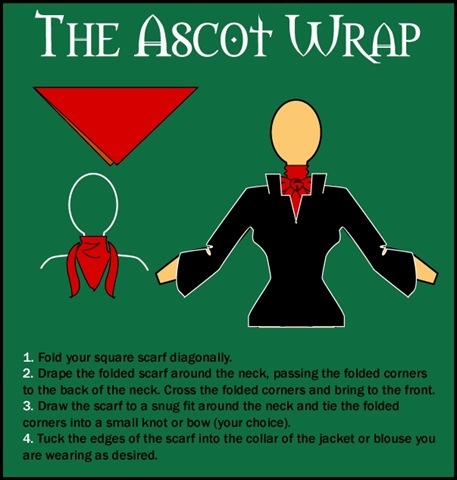 When wearing a scarf, Do try the neck wrap or ascot styles. Don’t wear deep V or plunging necklines. Don’t wear vertical striped shirts or shirts. Don’t wear blouses with extra large pointed collars. Don’t wear extra large hoops or dangling earrings. I would think that wearing a turtle neck if you have a longer neck would make it look like your neck is actually longer unless the neck of the shirt is bulky or has alot of fabric in that area. Excellent advice. Exactly, why you are on my blog roll. So many clueless women out there. Great website. I have just found out I have been buying many unflattering outfits! Thanks! Your post is very informative. Thank you! Thanks for the site. it is really informative. Does the same advise for a short neck apply to a thick neck? My neck isn’t really short, only thick. Hi Jody, thanks for the visit! I would say yes. If you have a thick neck, a V-neck neckline may be a good choice. It will help elongate your neck. Also, be sure not to wear choker-style necklaces. A good alternative is a long necklace or a really bold necklace that is in proportion to your figure (if your are really petite, you don’t want the necklace to be too big). jacket on TV celebrities–ie, Gwen Ifel–are quite unflattering. (I also have a full face and rather resemble a Caucasion version of Ms. Ifel.) I’ve decided that I’m going to try to walk around with my neck somewhat elongated to see if I can stretch it a bit. And do you think that some children, raised to be timid and submissive, may have grown up to have short necks because of this???????????????????? Great advice! The way a woman dresses with scarves and other accessories can totally change the way she looks. However, If you don’t want to wear a scoop or v-neck, especially in Winter, I’ve noticed that a cowl neckline can also look very good, as it’s a kind of false u-shape.